BASSETERRE, St. Kitts, February 11, 2019 (Press Unit in the Office of the Prime Minister) – Ministers of the Federal Cabinet were today, Monday, February 11, pleased to learn that Jaro Electronics Ltd., located at the C.A. Paul Southwell Industrial Site, has agreed to take on the employees of Lutron Liamuiga when that facility closes its doors on March 01, 2019. 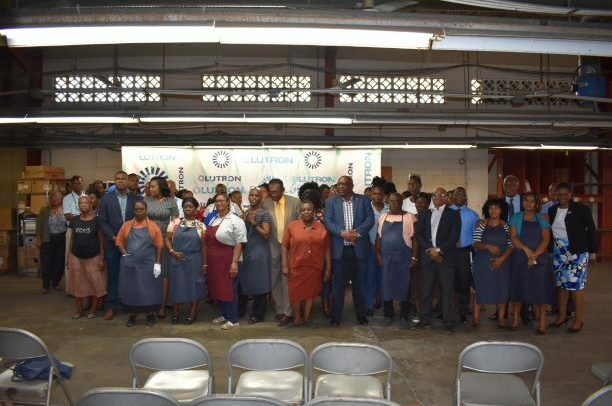 The announcement was made today by Senior Minister and Minister of Labour, the Honourable Vance Amory, while addressing employees of Lutron Liamuiga during a visit to the facility, as part of a planned tour of the different manufacturing plants in St. Kitts. The tour formed part of the calendar of activities organized in recognition of the Team Unity administration’s second anniversary in office. Minister Amory said the opportunity presented by Jaro Electronics is available to any Lutron employee desirous of a continued career in the manufacturing sector. Prime Minister Dr. the Honourable Timothy Harris expressed his satisfaction with Jaro’s decision. Dr. Harris stated that what is important to his Cabinet is that there will be no displacement of workers as a result of the imminent closure of Lutron Liamuiga. Lutron has been operating in the Federation for some 31 plus years.